View more information about trek difficulty level. We are a group of true nature lovers – we love the sea, the islands, the mountains, the rivers, the woods and the meadows. We wish to share with you the unforgettable moments of trekking, walking, climbing, bike riding, and at the same time to admire the nature, enjoy the view from the mountain tops or rest by the water spring and drink tea. Whether you are coming on your own, with your family, your friends or business partners, you will refill your battery and and experience the unique moments of bonding in the wild and undisturbed nature. You won't lack the adventure with our experienced free climbing or rafting instructors, our guides will teach you how to distinguish self-grown Mediterranean and mountain side plants, from which we will make delicious teas. We offer extensive range of adventure tours for single persons or small groups which combines both activities and leisure: walking and trekking with cultural sightseeing, domestic food and beverages tasting by the fire in mountain houses. Our trips are lead by a local professional mountain guides. We run imaginative and sensible itineraries and definitely do not "follow the crowd"
Discounts from the second trip onwards. 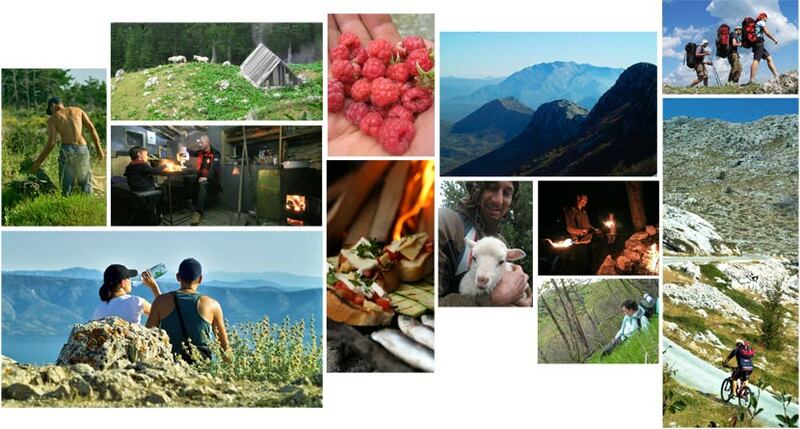 Copyright © 2015 Materials and photos are the property of the agency Dalmatia Trekking. All rights reserved.